Recently, I promised myself I was going to change my ways, spending more time writing than reading books about writing. My collection of writing books spans several shelves, I think it's safe to say (considering they're peppered throughout my house and I've never seen them all together). Most of them are great, useful books. I could learn a lot if I found time to actually read them, then – the hard part – put the new ideas to use. The problem is I buy too many. Some can't resist alcohol, others drugs, but for me, it's books. My collection ranges from fiction to nonfiction, books about fiction, books about nonfiction, books about books, books about writing and there's probably a book about books about writing in there somewhere. I certainly wouldn't be surprised. Second, when I pick one off the shelf I feel a certain stab of guilt knowing I'm spending precious writing time reading about writing when I could be writing. And maybe that's a little irrational, but that's also a whole lot me. I am, after all, a recovering Catholic. I do guilt really well. However… The reason we have rules in the first place is to find exceptions. 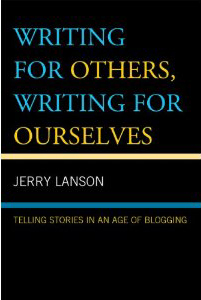 When I saw an ad for Jerry Lanson's book about writing in relation to blogging, and writing alongside the age of blogging, my heart went ZING! Three of my favorite things: writing, blogging and reading about writing about blogging, that's a little hard to resist. From the title I wasn't sure precisely what I'd find inside. I knew it would be good, considering it's written by one of a group of journalists who won the Pulitzer Prize for journalism when he was working at the San Jose Mercury News. But in the five years I've been blogging I've read an awful lot of negative opinions about bloggers, comparing us unfavorably with "real writers," or "real journalists." I'm a little raw, still, from a few rather scathing arguments I've had with book critics, and those were at least five years ago. Though the title implied a positive image of bloggers, there was still a little room for doubt. And was I ever relieved my first impression was right. It could hardly be more supportive of writers of all stripes, including bloggers. My blog serves as a very big part of my resumé, along with my published reviews, now defunct columns and other writings. It's helped me get a decent string of credentials, and several writing gigs. For most of that time my writing was free; no one paid me to write about books, promote authors or tell the world embarrassing things about myself. Then, one day, I got my first paycheck for my work. I was a professional. Suddenly all those unpaid years became absolutely worth it. Journalism complements the sort of writing bloggers do. The two styles can be very similar, if done well. Basically, the content of the book centers on good writing in general: how to focus your topic, how to find stories (posts, in the case of bloggers), how to conduct interviews, draft and find your own niche. Because good writing is good writing, Lanson didn't have to tailor his book to bloggers and journalists separately. When applicable he addresses blogging specifically, but in general not. The book is about skills: which are essential and how to develop them, crucial lessons all writers must have in order write effectively. I found his attitude blogging is a worthy endeavor impressive, stating its discipline can help anyone become a better writer. 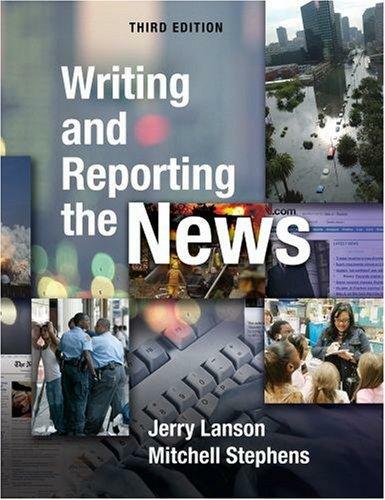 While being a journalist may have a better reputation, writing, like any skill, is learned and perfected by doing. The author realizes this, giving due respect to those who return to the keyboard regularly, plugging away, whether novelist, blogger or any other sort of writer. He never talks down to writers of any genre, never pulls rank. I find that refreshingly generous. Each chapter of Lanson's book discusses a different skill set every writer should employ. 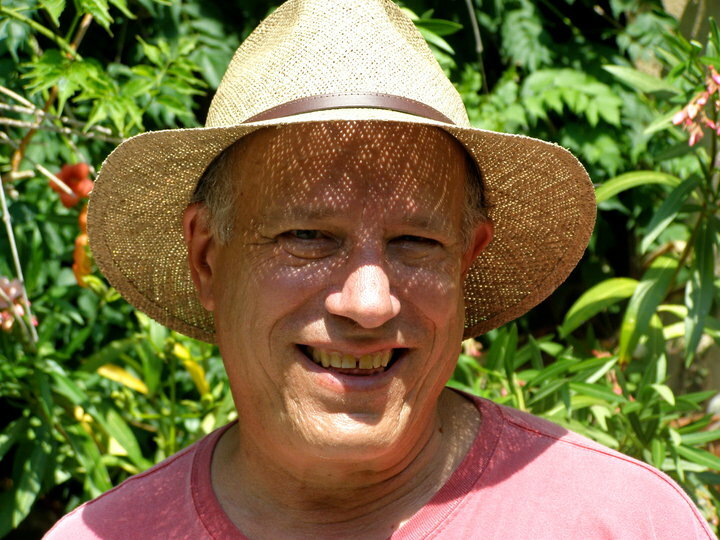 He uses personal examples, including bits of his writing, to help illustrate each subject. Finally, and this I found a huge help, he ends each chapter with thought-provoking questions and exercises designed to help any writer, experienced or novice, practice the material. The goal is to help writers think, to draw their attention to things they may not know or have forgotten. It's like taking mini-courses in writing without the cost, and at your own pace. The book isn't all theory; it gives concrete advice on how to improve, lists of what good writing is, suggesting the reader look critically at his or her own writing. It's written in a friendly, upbeat but honest style. This is no textbook. Rather, it's a useful, approachable read. I'll return to this book from time to time, especially on days I need the lift. Writing is a solitary affair, and unless you're surrounded by others like you it can be difficult to find someone who understands. Writing for Others, Writing for Yourself is a motivational read. If you frequently experience the dreaded writer's block you can turn to the exercises and work on one of them. I'd be surprised if any writer didn't find that useful, if it didn't help turn a bad writing day around. As an all-around, concise book about writing, I cannot recommend this book highly enough. It isn't the longest book I've read on the subject but it is among the most useful. A truly worthwhile way to spend precious reading time without ever feeling you've wasted even a moment. I certainly have my favorite (and my share of) writing books because it’s easier to read about writing rather than doing it. I like this review and plan on adding it to my reading list. It’s his down-to-earth quality I thought made his book stand out. You can get loads of good advice on writing, but his supportive style is important to budding writers (who are pretty much always lacking in confidence). Plus, the Pulitzer. I have to respect the Pulitzer! Previous Post A few of my favorite things: Book Art.